1. Will the owner be onsite? Unlike some builders, Jeff Andre is onsite daily as needed. He knows his reputation is on the line with every job; being onsite allows him to spot potential problems before they occur. And, customers have easy access to Jeff. They aren't forced to go through layers of foremen and managers before getting action. 2. How accessible is the builder? Can I reach him anytime, anywhere? Jeff makes his cell phone number available to every customer. Call him any time, any day, anywhere. Customer satisfaction is our primary goal. 3. How do you define "custom"? Is it a model that I pick colors for, or is it a unique luxury home? We don't have model homes (although we can provide designs for customers who don't have the time or interest in designing a fully custom home). To us, "custom" means a design that meets your specific wants and needs, on land that you enjoy, using any material, shape, size, or quantity you wish. We pride ourselves in building whatever you ask for, as custom as custom can be. 4. What percentage of your jobs were over budget? We pride ourselves on every project coming in at or below budget. Keep in mind that customer-requested change orders (changes after the acceptance of our original contract) dictate a corresponding change in the overall budget. 5. What warranties will we get? We offer a one year warranty in addition to manufacturer warranties. Our customers will tell you that we are happy to help after the warranty expires, too. 6. Do you hire subcontractors, or are your craftsmen on your payroll? Some builders rely on their in-house staff of cross-trained tradesmen to provide every detail of a new house. At LAB Construction, we prefer to hire the best of the best as your project dictates. Cross-training is a good idea at McDonald's, but our niche craftsmen have honed their skills throughout their careers, and it shows. 7. We both have full-time careers. How can we find time to build a custom home? One of the most useful assets offered by a builder should be their ability to guide you through the maze of home building. Make no mistake about it — building a custom home will require you to make many decisions. A good architect needs to be... a good builder. Jeff Andre will organize the project for you so you can spend as little time as possible thinking about the details of your new home. 8. How long will the job take? The size of a project, it's complexity, and the level of fine detail involved will define the timeline. 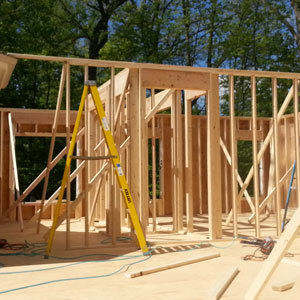 As a general rule, new construction projects require at least seven months. 9. Does weather affect the building process? Yes it most certainly can but if your project is managed and performed properly, with foresight, most weather related complications can be minimized or worked through. 10. Can we work with our own architect and have you build the house? Absolutely. If you are searching for an architect, we can provide input regarding local architects' abilities, skills, and design. 11. How do we find a site to build on? LAB Construction has contacts in the local real estate industry and can connect you with knowledgeable brokers. Also, we often have properties available in the area. 12. Will you build on land that we already own? Yes (assuming it is buildable, zoned properly, and your house will fit). 13. Can I tour homes you've built? Yes. We are proud to have satisfied customers who have graciously offered to show their houses to our potential customers. We can also provide additional addresses of homes to drive by of almost every shape and style imaginable. 14. How do I investigate a builder's background? Talk to local building departments, tradesmen at the hardware store, real estate professionals, title companies, neighbors, friends, family, and so on. Check for complaints at the Better Business Bureau. Search for liens at the County Clerk's office to see if the builder is paying subcontractors.